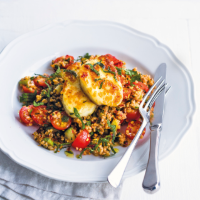 Toss some sliced fresh red chilli through the bulgar wheat for an extra kick. 1. Simmer the bulgar wheat in a small pan of salted water for 10-15 minutes, until tender; drain well then fluff up with a fork. Add the salad onions, tomatoes, cucumber and herbs. 2. In a small bowl, whisk 2 tbsp oil with the lemon zest and juice, tomato purée and chilliflakes; season, then toss with the salad. 3. Heat the remaining ½ tbsp oil in a frying pan over a medium-high heat. Cut the halloumi into 8 slices, then fry for 1-2 minutes on each side, until golden. Divide the salad between 4 plates; top with the cheese. This recipe was first published in June 2015.